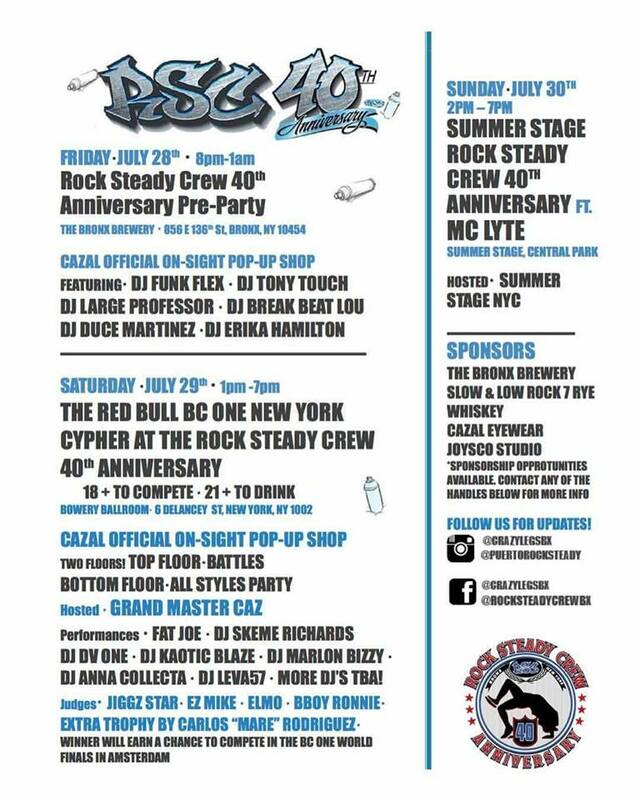 July 29th documented the last Rock Steady’s Crew Anniversary Jam in New York. What not better way to celebrate their 40th year and end it with a bang than by adding a Red Bull BC One Cypher, the third official USA qualifier for the northeast! Brought to you by Crazy Legs, Ynot and the members of Rock Steady, it was a weekend of announcements and celebration for the closing and opening of chapters for the crew. The last anniversary is being preceded by a music festival initiated by Crazy Legs called “Rock Steady For Life”, and the crew is now in the hands of the new vice president, eventual leader, Oriana Ortega (Bgirl Feenx)! The weekend was official! Kicking it off with a dope outdoor preparty at a local brewery, The Bronx Brewery, which featured open cyphers, live DJ’s Erika the DJ, Duce Martinez, Break Beat Lou, Tony Touch, Tedsmooth, Funk Flex and an epic performance by the Large Professor, the whole night exceeding expectations that Rock Steady knows how to party! The main event started and ended with good vibes! Hosted by the legendary Grand Master Caz and held at The Bowery Ballroom, a venue with chilling AC, dope lighting, booming sound system, and an upper and lower level to get down. The night not only featured the Red Bull BC One competition, but DJ’s Skeme Richards, DV One and Kaotic Blaze killing it on the 1s and 2s and a fire performance by Fat Joe reliving the classics! Must also mention Crazy Legs making a special appearance on the wheels of steel in the lower level of the venue where plenty of cypher call outs and battles broke out! Participants compete at The Red Bull BC One New York Cypher at the Rock Steady Crew 40th Anniversary in New York, NY, USA on 29 July, 2017. Red Bull BC One New York Cypher was open to all US residents 18 years old and over. The qualifier brought in 58 competitors representing the tri state area and surrounding states, and states as far as Arizona, Wisconsin, Wyoming, South Dakota, and Hawaii to name a few. The talent pool featured influential OGs and several up-and-coming Bboys and Bgirls. The panel making the tough calls were Jiggz Star (Supreme Beingz), Rock Steady’s own EZ Mike, and Elmo (Street Masters Crew) with Red Bull BC One All Star’s Ronnie (Full Force/Super Cr3w/7 Commandoz/Super Wockee) filling in as an alternate judge. Judges, EZ Mike, Jiggz Star, Elmo and Ronnie pose for a portrait at The Red Bull BC One New York Cypher at the Rock Steady Crew 40th Anniversary in New York, NY, USA on 29 July, 2017. 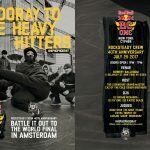 1 vs 1 Bboy/Bgirl battle for a guaranteed spot at Red Bull BC One Last Chance Cypher Final in Amsterdam in November 2017. Prize included roundtrip plane ticket, hotel accommodation, guaranteed attendance to Red Bull BC One World Finals. 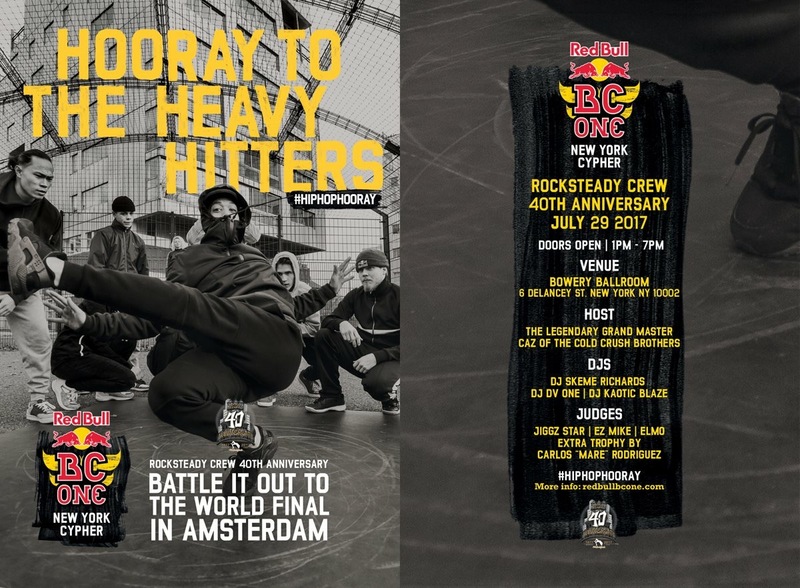 The winner gets a chance to battle it out vs 30+ BC One Last Chance Cypher winners from across the world for a shot at the final spot in Red Bull BC One 2017 World Finals! Congrats to Pop for taking the win! In his first Red Bull BC One debut, at 19 years old, Pop wins the 2017 New York Cypher and proudly represents the Street Masters Crew. Pop celebrates after winning The Red Bull BC One New York Cypher at the Rock Steady Crew 40th Anniversary in New York, NY, USA on 29 July, 2017. Event winner, Pop poses for a portrait at The Red Bull BC One New York Cypher at the Rock Steady Crew 40th Anniversary in New York, NY, USA on 29 July, 2017. • Carlo Cruz (IG: @carlocruzphoto), official event photographer! 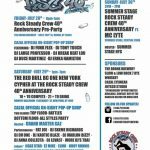 Rock Steady Crew pose for a portrait at The Red Bull BC One New York Cypher at the Rock Steady Crew 40th Anniversary in New York, NY, USA on 29 July, 2017.